Guide in 'Disciples of Magic' published by Madrone Damodred, Apr 4, 2015. I like to make things go boom. So how do I play the new THM? The new paradigm: THM has changed in ARR to add some complexity to its playstyle. When you cast Fire spells repeatedly, you gain the Astral Fire buff that increases Fire's damage and mp cost in an escalating way. When you cast Blizzard spells repeatedly, you gain the Umbral Ice buff that boosts mp recovery. These each also lower the mp cost and damage of the opposite element's spells. Casting the opposite element will cancel the buff and that is not the way you want to switch between them. The level 6 ability Transpose will toggle this buff from one element to the other without resetting it. As you get higher level, you will be able to stack Umbral Ice or Astral Fire in 2 and eventually 3 tiers. Using Transpose preserves and converts the buff to the other element, allowing you to get the best damage by casting Fire spells until mp is low, then switch mode, and then get mp recovered while using Blizzard spells, then switch mode and resume Fire spells. INT increases magic damage. So does your weapon, so keep it upgraded!! VIT increases your hp. PIE increases your mp. MND increases Curing potency. DEX will help you parry and block more, while STR will increase the amount of damage parry and block mitigate, and the miniscule damage you do by whacking things. This is a no-brainer. INT, VIT, and PIE are important. PIE's a maybe seeing how fast you can recover mp using Astral Ice. The amount of points you get to allocate is a drop in the bucket compared to your overall stats at higher levels and from gear, so don't fret too much about it. If you really want to min-max it for THM/BLM then here are the racial starting stats as of beta Phase 3. If you prefer a particular race, stick with it, but the clan you choose within a race might offer better magey stats. I know that's hard to read. Best 3 by INT are Duskwight Elezan, Wildwood Elezan, and Midlander. Subpar INT races are Sea Wolves Roegadyn, both Mi'qote, and Highlander. Pull with Blizzard. It inflicts heavy so your target will take longer to get to you. Stick a Thunder for Damage Over Time. Use Fire repeatedly. Your MP will run low pretty fast. Reapply Thunder if the enemy still has a lot of health. Enter the Sandman: Sleep lets you take a break from a fight for 26 seconds and makes you on point to control adds in group play. Add Sleep to the mix if you need to when solo. It'll give you a chance to reposition and recover hp/mp. Enfeeble resistance will come into play on the 3rd cast. The first two casts should give you a good duration though. Initial damage of Damage Over Time spells will wake enemies, but if you stick DOTs before Sleep they'll be out like a light and taking damage. Transpose will refresh your Astral/Umbral buff even if you aren't casting the element that would normally do so. So you could Cure Cure Transpose and still have the Astral/Umbral buff up for 10 more seconds while you move to another location and prepare to resume your nuking. You can also use this trick while healing a group to give yourself more time to spend on Cures before you have to nuke again to maintain your Astral/Umbral buff. Surecast: This ability helps make sure you don't get interrupted. Use it profusely to get in the habit. Its recast is a short 30 seconds. Because of how interrupts work, a lot of things you take on solo in low levels won't interrupt you. Its best for things like a critical Cure or Sleep, or when an enemy readies a special attack. The harder hitting your target, the more use you'll find for Surecast. It will be upgraded later on to have a 15% chance of having 0 recast. Take a break and diversify: Since we've progressed a few levels through THM abilities, its time you consider leveling CNJ for Cure(2), Aero(4), Protect(8 ), and Raise(12) if you don't already have them. Leveling Archer to 4 for Raging Strikes is also pretty easy while you're out in Gridania. You'll also want to level Arcanist at some point for its cross skills- unknown what they are at this time. Level 15 THM quest spell: Scathe is an instant cast non-elemental spell with potency 100. Its not strong, but there's something to be said for instant casting. You'll get a trait down the road that gives it a 20% chance of doing double damage. Aero from CNJ is also instant cast and stacks nicely with Thunder. Instant cast spells are good for sneaking damage in on some types of FATE, where targeting is difficult because mobs are dying fast. Instant casts are also good for a quick finishing move and kiting tactics. Let me restate that finishing move part... with a long cast time on regular nukes, when a mob is close to dead, use Scathe instead. Got a chain of adds coming through in Halatali bosses that cause battlefield AOE? Tab target and Scathe them down. Bunch of pods in Totorak boss battlefield? Scathe and Fire II to the rescue! Where are the Conjuirer's? You may find yourself invited to main heal low level group content. If you can cast a few Blizzards now and then, you have basically unlimited MP for Curing. With CNJ skills you can main heal in lower-mid levels and with Sleep you'll be controlling adds to save your fellow adventurers from needless damage. Get ready for a power boost at 20! Astral Fire II and Base Action damage +10%! I nearly doubled my damage when I dinged 20. Granted I also already had a level 20 green weapon in my Armoury Chest and a bunch of level 20 green armor from leveling CNJ first. Because of this leap, be cautious about starting out with Fire cycle. You'll find it much easier to take hate from tanks after level 20. Ok, so here's the thing, you pickup Blizzard II and Fire II but when should you use them? Those clams in Satasha and all the little sprite things around them are perfect for Blizzard II. There's a good chance for AOE in Copperbell Mines with the bunny/bomb storm. Also the slime boss once you've bombed it to a bunch of pieces and can hurt it. Blizzard II is self-target centered and also causes Bind. Its low damage, but good to stay under hate threshold. I use it in fates a lot. If you don't have others getting threat on the same targets, it can be dangerous to use though. Fire II is targeted AOE and pretty strong thanks to Astral Fire. Burns your mp faster than Fire I's too. Ordinary pulls. MRD tanks are a little better at AOE hate generating than GLDs. Also, if your group makeup has others with AOE damage, it might be fun to AOE the 3+ mob pulls. Make sure your healer and tank are ok with this. Its a bit more stress for the healer, and the tank needs to focus on AOE threat rather than single target threat. True stories. Tank and CNJ died early to a bomb in Copperbell Mines slime sub-boss one time. I took over tanking by Curing myself and occasionally a Blizzard II/move away tactic, while the MNK popped bombs and killed the bunny things. Everyone died to FlameMane? sub-boss in Halatali one time. I was left standing with him at 20% and all the add things done. Alternating Cures and Blizzard, I eventually took him down solo. This will really shine when fighting things that live longer than a few durations of Thunder's DOT. Initial damage and DOT duration increase with each Thunder tier. We're talking overall 190 potency for Thunder (over 12 seconds), 250 for Thunder II (over 15 seconds), and 300 for Thunder III (over 18 seconds). I'm not sure how this % is calculated... like if all 3 Thunder spells are stacked is it 15%? Or does it increase based on number of ticks that have occurred? Still some unknowns at this point. I have a feeling that it'll replace Blizzards in your rotation once you get a few Thunders and Thundercloud.... unless the target is almost dead. On Black Mage, you'll be able to pick from Arcanist skills (which are still unknown at this time) and Archer skills. You'll have to level one of those two to 15 to unlock Black Mage (I think its Archer). However, there's a whole lot of utility for Thaumaturge in Conjurer skills. Raging Strikes (4) Increases damage dealt by 20% for 20 sec. Cooldown 3 mins. Nice damage boost. You may not set it much until you get several cross slots though. Hawk’s Eye (26) Increases physical accuracy by 20% for 20 sec. Cooldown 90 seconds. Hopefully your magic accuracy will be good enough that you won't need this. Quelling Strikes (46) Reduces enmity generated by each attack. Lasts 15 sec. Cooldown 2 mins. Nice way to stay under hate threshold when using damage +% abilities. Its a lot of work to get it though. Wow that's half of BLM cross class stuff still out there in the aether! Stone (1) Deals earth damage with a potency of 140. Causes Heavy +40% for 20 sec. Pretty much like Blizzard without the Umbral Ice. Slightly lower potency (140 vs 150). Cure (2) Restores target HP with a potency of 300. High utility. You can main heal at low levels. Aero (4) Deals wind damage with a potency of 50. Wind DoT for 18s with 25 potency. Nice to stack with Thunder (its actually more total potency by 10 if it runs the full duration). Aero instant casts like Scathe. Cleric Stance (6) Swaps INT and MND attribute ratings, while increasing (damage or potency?) of attack spells by 10% and reducing potency of healing spells by 20%. Effect ends upon reuse. I wouldn't bother with this... it winds up being a wash either way. You're putting your higher stat to use for healing, but taking a 20% healing potency hit. You're taking a lesser stat for your nukes and only getting a 10% potency boost. See why it doesn't work so well for a THM? Nice utility if you're not in a group where someone else has this. 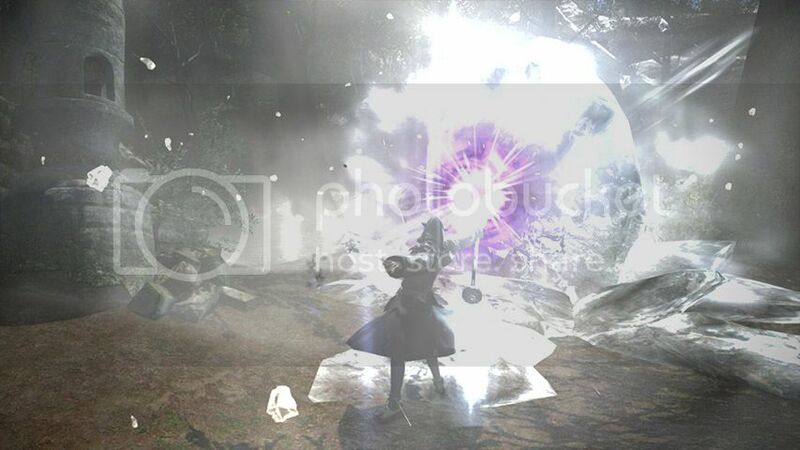 Raise (12) Resurrects target to a weakened state (Low HP/MP/TP). Cannot be used in combat. Nice utility if you're not in a group where multiple people have this. Stoneskin (34) Creates a barrier around target that prevents physical damage totalling 10% of target’s maximum HP. Lasts 30min. Better used on tanks than mages due to hp calculation. Good solo skill, cooldown's not bad. PGL : Defensive solo stuff, instant self-cure, and those crits! Evasion boost for oh crap moments. Parry's probably not going to save you. Very nice and low cooldown compared to Raging Strikes. GLA : Defense and enmity boosts, nothing much worthwhile here.